« Are You Called To Be A Leader? We each go to work everyday for many different reasons, I hope one of them is that you really enjoy what you do each day enough to look forward to coming back to work the next day. Being a Medical Assistant is a really wonderful career, we get the opportunity to work along side our doctors to help make our patients feel better. We have the privilege to assist our physicians to make their job easier and we have the opportunity to assist our patients to help them with whatever their needs are while they are under our physicians care. This alone can be very rewarding each day, but when we are thanked by our physicians and the patients we care for the reward is “SUPER-SIZED” for us, and this what happened in our office for one of our assistants. As I said, medical assistants have such wonderful opportunities to help people in need when they present to the office, and Julie (one of our Certified Assistants) was thanked in a special way for all of the kindness and care she has been showing a patient over the past couple of years. Apparently, when Julie was helping this patient at her last appointment she mentioned that the Fall was her favorite time of year, as she was a Fall baby and just loved this season, so when this patient showed up for her appointment she had a beautiful present for Julie as an early Fall/Birthday gift for her. 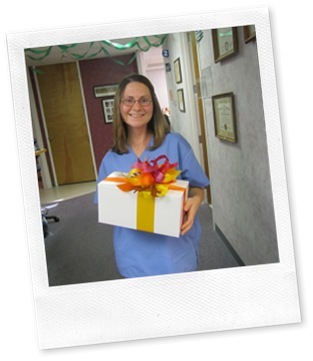 If you cannot see by Julie’s face in the picture….she was really WOWed by this patient’s kindness and generosity towards her. Julie loves what she does and it comes through to the patients she serves, they feel her caring and it kindles relationships that will continue to grow through the years. Building relationships with our patients can only happen when the people who work in the medical practice really want to be there. They truly enjoy and have a passion for what they are doing. Just as an aside, this patient also brought a box of chocolates for the rest of the office staff so we knew that she appreciated all of us too. Moments like this make us all realize that Medical Assisting is a great career and we are so glad we have the opportunity to make a positive influence on the patients that come to our office for care by our physicians. It doesn’t matter what your career is, what matters is that you enjoy what you do and what you can do for others while doing it. This entry was posted on Monday, November 24th, 2014 at 8:00 am by Tina Del Buono, PMAC. Filed under Educational Tips, Medical Staff, Motivational, Team Work. You can follow any responses to this entry through the RSS 2.0 feed. Both comments and pings are currently closed.